Did you catch this interview? Before signing off for the weekend, I just wanted to encourage you to watch it if you missed it. 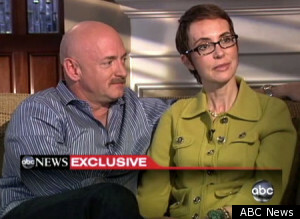 Diane Sawyer interviewed Gabby Giffords and her husband Mark on 20/20. It aired on Monday night, and I'm still thinking about it. I was moved. The way they were able to document her progress from just days after the shooting to now was humbling, heartbreaking, inspiring and showed true courage and the amazing capacity of the human spirit to do the impossible. It is true that bad things happen to good people. Gabby is a great example that those circumstances don't have to overcome us, but rather shape us. If you have a moment this weekend, check it out here. You won't regret it.